The story opens with Maika, our young protagonist, being sold as a slave. You see, while Maika herself looks human, she is, in fact, an arcanic. The issue explains that the humans and arcanics were very recently at war, and reveals that many arcanics are oppressed, enslaved, or worse while inside the walls of the human city, Zamora. Liu has stated that the arcanics are based off of the yōkai of Japanese folklore. As such, they come in many different forms. While Maika appears human, there are others with animal characteristics, such as the adorable little fox girl, Kippa. The creators have mentioned that one thing the series will be exploring is how one survives and copes after living through a cataclysmic war. 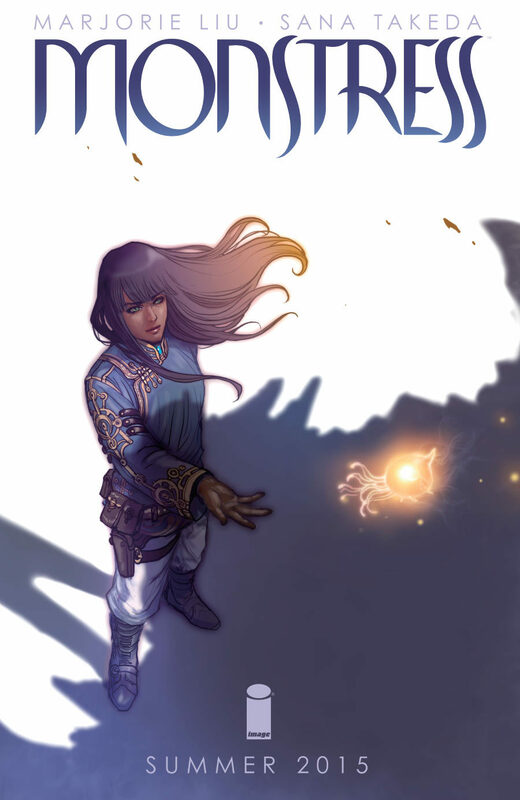 Liu, a Chinese-American, says that stories she heard growing up of her grandparents’ experiences in World War II and its aftermath deeply influenced her and played a large part in the genesis of Monstress. Indeed, as the series opens, Maika seems bitter and broken by what she had seen and done during the course of the war. This first issue plants many seeds of things to be explored, and Maika’s mysterious past is a major one. Another critical aspect that was heretofore only touched upon is Maika’s connection to a giant, kaiju-like monster. Liu and Takeda have done a marvelous job of setting the stage for Monstress with rich worldbuilding. Aside from the arcanics, there are the Cumaean “witch nuns,” cat spy-assassins, and the massive apparitions known as monstra. Even in the first issue, it is clear that the series’ title holds many meanings. It can refer to Maika’s non-human “otherness,” the literal monster she is bonded to, her feelings at being broken (physically and psychologically) by the war, etc. 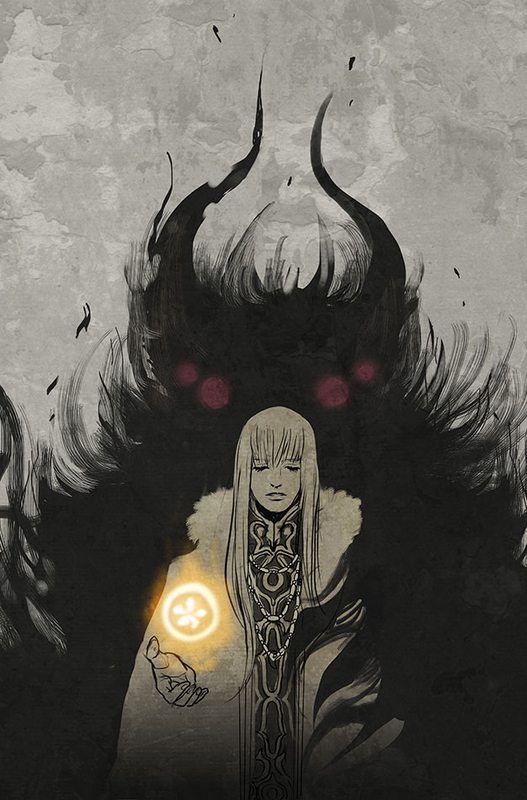 Monstress is a dark book set in a dark world. In this first issue alone there was slavery, torture, cannibalism, murder… But this is ultimately a book about survival, about finding one’s own strength and humanity. Maika is a far cry from conquering her inner monsters, and I look forward to her journey throughout issues to come. Before I wrap things up, I would be remiss for not mentioning how exciting it is to see two Asian women (Liu is Chinese-American, Takeda is Japanese) spearheading a comic at a major company like this. As a Filipina-American geek myself, it’s inspiring to see the representation of Asian women both on the page and on the creative side. These two have created something truly special with Monstress, and I can’t wait to see where they take the series next! 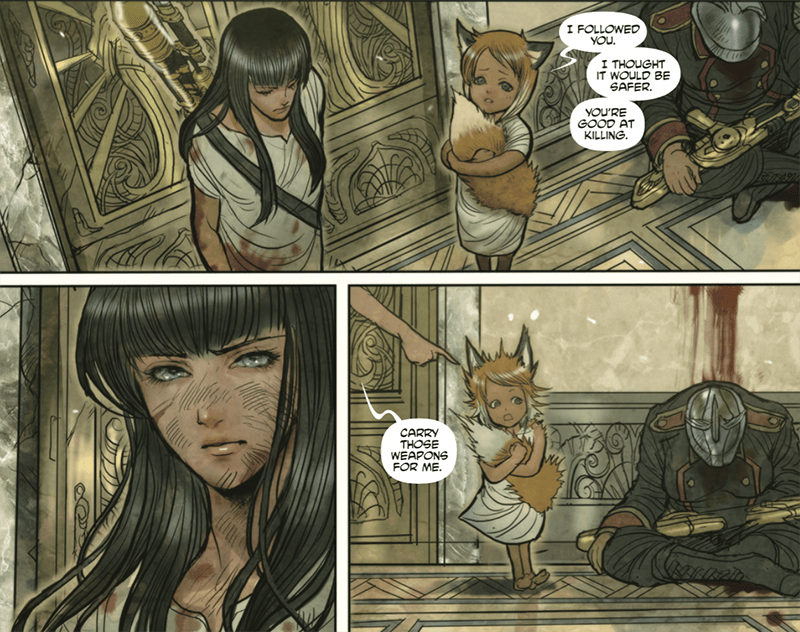 All in all, I thoroughly enjoyed Monstress #1. The world and characters of are unique and interesting, the art is breathtakingly stunning, and the story draws the reader in with promises of powerful magic, strange creatures, action, intrigue, and a tale of self-discovery for our young protagonist. If any of that seems of interest to you, I highly recommend picking up this first issue. 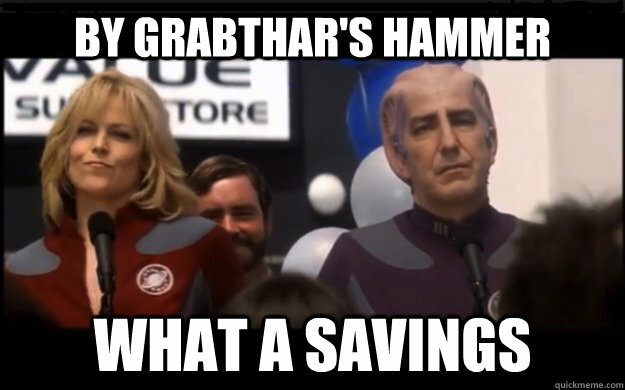 (Especially for 66-pages at $4.99!) You can find it at your local comic shop or online at Image or Comixology. Disclaimer: All images shown belong to Marjorie Liu, Sana Takeda, and Image Comics, the use of which have not been specifically authorized by the copyright owner. This blog post is for non-commercial criticism and comment purposes only. 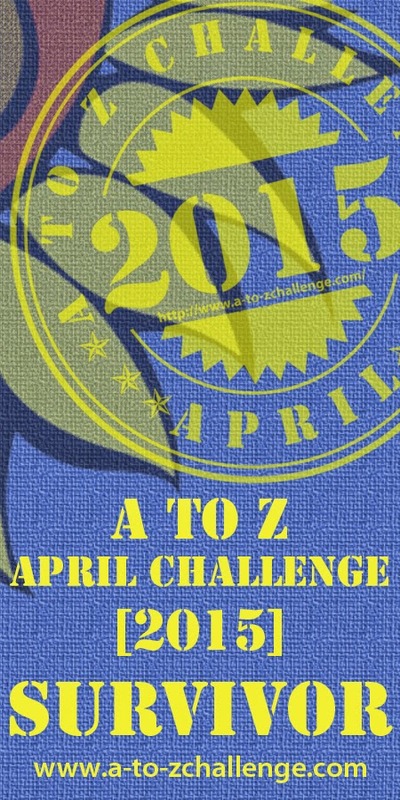 I believe that this constitutes a ‘fair use’ of the copyrighted material as provided for in section 107 of the U.S. Copyright Law.